From medieval Runnymede to twentieth-century Jarrow, from King Alfred to George Orwell by way of John Lilburne and Mary Wollstonecraft, a rich and colourful thread of radicalism runs through a thousand years of British history. In this fascinating study, Edward Vallance traces a national tendency towards revolution, irreverence and reform wherever it surfaces and in all its variety. He unveils the British people who fought and died for religious freedom, universal suffrage, justice and liberty - and shows why, now more than ever, their heroic achievements must be celebrated. Beginning with Magna Carta, Vallance subjects the touchstones of British radicalism to rigorous scrutiny. He evokes the figureheads of radical action, real and mythic - Robin Hood and Captain Swing, Wat Tyler, Ned Ludd, Thomas Paine and Emmeline Pankhurst - and the popular movements that bore them. Lollards and Levellers, Diggers, Ranters and Chartists, each has its membership, principles and objectives revealed. "Powerful . 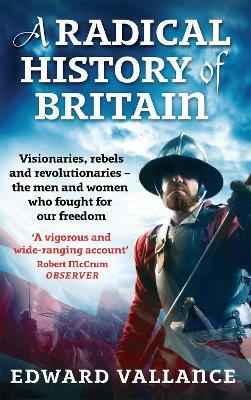 . . a vigorous and wide-ranging account." "Observer""
"Could not be more timely. . . . An extremely instructive and comprehensive survey." "Daily Telegraph""